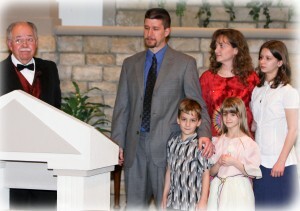 Roger & Julie Tate and their children began serving the Lord in Kenya, East Africa in 2008. Please allow me to introduce myself and my family. We are Roger, Julie, Emily, Amy, and Josiah Tate. We are from Dayton, Ohio and sent out by Emmanuel Baptist Church in Bellbrook, Ohio where I attended for more than 27 years. A few years after the Lord saved me he began directing my life towards missions by giving me a heart for missions. This constituted a big change for a young man who previously had no desire to leave the comforts and culture of the United States. However, what the Lord begins in us He always finishes and though my desire for missions started and grew slowly, God eventually brought me to submission to His will for missions in my life. At this point in my life, however, I did not know where the Lord was leading me. All I knew was that he was leading me to some cross cultural mission field. While struggling with the questions of where, when, why, and how, God provided us an unbelievable gift – the opportunity to go on a short term missions trip. I had been praying for just such an opportunity for two years. This was definitely from God, as he provided all our expenses for the trip through the generosity of some good, mission minded friends. We would be going to Kitale, Kenya to visit the ministry of Mike & Pam Anderson. I went to Kenya with one overall purpose in mind: To allow God to use the experience to solidify in my mind His will for us to go to the mission field. For me, it was a trial run. I was hoping God would use it to answer some of my questions, to help me with some of my fears, and to guide me into my future ministry. He did this and more. In fact, he did something surprising. He gave me a heart and a zeal…FOR KENYA AND THE KENYAN PEOPLE. This, I was not expecting. I had never really had thoughts toward Africa before. In fact, when I was a younger man I said I would never go to Africa as a missionary. God has a mysterious way of changing our hearts. Now, Kenya, Africa is my heart’s desire. I desire to minister and serve there, to see native Kenyan people come to the saving knowledge of Jesus Christ, to see indigenous churches being built and firmly established in the faith and in God’s word, and to see the glory of God shining on this far away dark continent. Please pray that God would use us mightily in his service to glorify His name and extend his kingdom in Africa.